Teacher Wraparound Editions offer lessons organized to follow a logical progression from Getting Started through Evaluation. Objectives supply two or three concrete, measurable objectives that allow an interconnected approach to lesson segments. Overview gives a brief analysis of the music being taught. 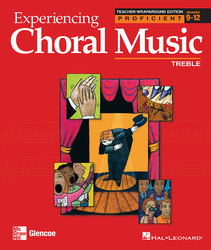 Link to Learning includes exercises that focus on vocal, theory, and artistic expression elements of the upcoming song. The lesson plan is divided into 3 sections: Introduce, Rehearse, Refine. Progress Checkpoints at the end of each lesson section offer a quick assessment of the materials covered to that point.